Since today the world is mourning the loss of Andy Griffith, I thought I’d take a look at his namesake show. I am coming at this largely unbiased, as I don’t really remember the show. I must have caught an episode or two as a kid and of course I remember the theme song, but that’s about it. The pilot is titled “The New Housekeeper,” which is pretty darn literal. It opens with a wedding at the Mayberry Courthouse, with a lanky Justice of the Peace presiding. In a twist on the Speak Now or Forever Hold Your Peace trope, an adorable little boy of about 6 pipes up, “I know why they shouldn’t be married.” The boy, Opie (Ron Howard, of course), is upset that the bride is leaving her post as his family’s housekeeper. The scene provides a strong bit of exposition and establishes Opie’s character as an ornery but loveable little scamp. “Just ’cause I’m little, nobody cares about me,” he proclaims. His dad, Andy, eventually regains control of the ceremony and pronounces the happy couple man and wife. The newlywed housekeeper, Rose, is about to be replaced by Andy’s Aunt Bee (Frances Bavier)–the assumption being, in 1960, that every home has to have a woman to cook and clean. “She’ll raise you just fine,” Andy tells Opie. Though we see Andy doing his fair share of child-rearing very ably, it looks like the idea is to paint him as a fishing buddy as much as a parent. Opie sets about trying to discourage Aunt Bee from hanging around, convinced she’s bad for the family — which includes a dog, a bird, a mouse, a snake, and an itinerant lizard. When Bee accidentally lets his pet bird escape, his worst fears are realized. The jokes are a little obvious but with a child so young, Andy’s corny sense of humor is fitting for a loving if chagrined father. 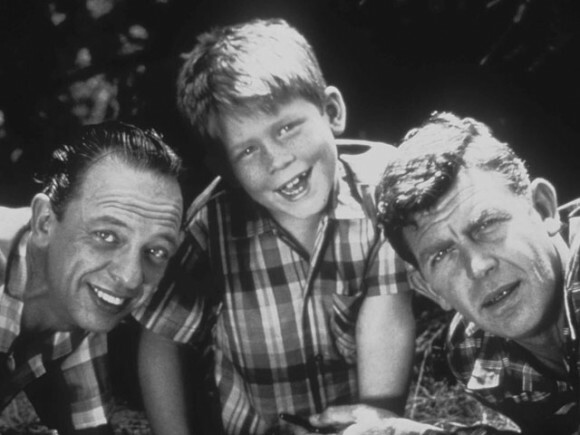 The chemistry between Andy Griffith and little Opie Cunningham (to quote Saturday Night Live) is unmistakable. When they lie side-by-side across the bed discussing Opie’s plan to run away from home it’s impossible not to love them both. You can see why the show won 6 primetime Emmys. As we now know its place in TV history, The Andy Griffith Show is largely about the little town of Mayberry and its colorful inhabitants; a forbear to Gilmore Girls and a thousand other shows. But the pilot shows us very little of the town; it’s very much about the family and their home, establishing a humorous but sentimental tone that clearly made an impression on the hearts of millions of viewers. It’s a chicken soup for the soul kind of show. This entry was posted in 1960s, Comedies and tagged Andy Griffith, Andy Taylor, Aunt Bee, Mayberry, Opie, Ron Howard, small town, The Andy Griffith Show by meekthegeek. Bookmark the permalink. All of my childhood TV hero’s are dying off. Giliigan, Maxwell Smart, now Andy….it will be a sad, dad day when Adam West goes. Thanks for stopping by B5! We just finished a couple of months ago watching all 8 seasons of Andy on Netflix and it was awesome. This show is one of the greats. And I think the reason for it is its ability to be so cross-generational in its appeal. The show found a formula and stuck to it, mostly (the switch from B&W to color also brought in new writers who were more about highlighting goofy situations rather than the larger than life characters).